Explanations and examples of these essential principles offer philosophical and practical guidance that suggests a variety of paths teachers can take toward creating higher quality learning experiences for their students. For your free teaching guide or to receive additional information, contact VP of Education, Roger Hardig at rhardig@bhpsite.org or call (317) 631-1888. 1. You can use a balloon or make a papier-mâché balloon. The balloon will be the top of your lantern. To make a papier-mâché balloon, place a thin layer of papier-mâché tissue over a balloon. When the tissue is dry, decorate it with pictures. Puncture the balloon. The resulting opening will slide over the tube, after you have decorated it and inserted the flashlight. 2. Decorate the outside of the tube any way you like. You might try crepe paper, streamers, or just color the tube red, white, and blue. After you have decorated your tube, insert the flashlight. 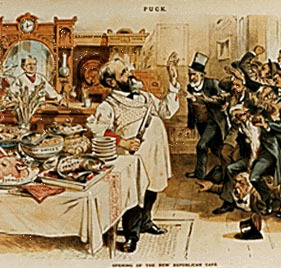 This political cartoon appeared in “Puck” magazine, and was drawn by J. Keppler. “Puck” was a Democratic Party supporter. 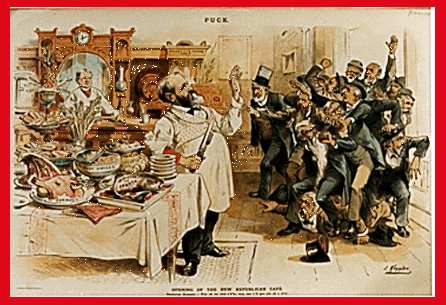 President Benjamin Harrison is standing in the center at the table ready to serve the gentlemen. The man behind the bar has an “M” on his tie. the three tier dish behind that holds rolls labeled- Ministers to Italy, Russia, Spain, China, Brazil, Austria, etc., and Consuls to Rome, Berlin, Nice, Dublin, etc. The gentlemen coming in the door include James G. Blaine, of Maine; he is the one sneaking in the back with the top hat on. After reading the above information can you answer the following questions? 1. Who is the man standing behind the bar, and why would he be pictured right behind President Harrison? 2. What jobs need to be filled? 3. Why are the men on the right pushing and clamoring to approach Harrison? 4. Why is a table of food used to symbolize the cabinet offices? 5. Why would titles like “Minister to France” be represented by food? 6. Why is Harrison’s hand up and why did the artist draw it so large? 7. What group is represented by the crowd of men coming through the door? 1. The man is Levi P. Morton of New York. He was Harrison’s Vice President. 2. Ministers to foreign countries, post office positions, etc. See description under picture of jobs listed on the food. 3. They are competing and demanding appointments to the cabinet and other offices. 4. The food symbolizes services of the government to the people. 5. Political favors and appointments are sometimes referred to as “Pork- Barrel Politics”. 6. Harrison’s hand is up as if to say: Stop! I am in control of this! The artist purposely drew it large to show that Harrison was the boss. 7. They represent the Republican Party establishment. On your own, you might want to find out more about James G. Blaine and other politicians from the 1888 period.